Hakusan, Japan, June 10, 2015 – EIZO Corporation (TSE: 6737) today announced the new ColorEdge CS270, a 27-inch color management monitor that fits the varying needs and budgets of photo enthusiasts and graphic design professionals. The ColorEdge CS270 offers many of the advanced features of EIZO’s ColorEdge lineup such as a wide color gamut and hardware calibration. It also delivers benefits not usually available with cost-performance monitors such as dedicated calibration software that supports compatibility with a wide range of third-party calibration devices and a manufacturer’s five-year warranty. The ColorEdge CS270 features a wide-gamut IPS (in-plane-switching) with a 2560 x 1440 native resolution and reproduces 99% of the Adobe RGB color space. With this extended gamut, images shot in RAW can be converted to Adobe RGB or images shot in Adobe RGB will be displayed in vibrant and lush colors. An LED backlight reduces power consumption to just 34 watts during typical operation and utilizes brightness modulation technology for flicker-free image display to help prevent eye fatigue. The ColorEdge CS270 comes equipped with DisplayPort, HDMI, and DVI input terminals. With the DisplayPort input, the monitor offers 10-bit display1 (more than one billion colors simultaneously) from a 16-bit look-up table. In addition, it can display 10-bit color via the HDMI input terminal with Deep Color applicable devices. EIZO’s DUE (digital uniformity equalizer) technology compensates for uniformity errors common to all LCD panels to produce more even brightness and color across the screen. With DUE, the screen stays uniform even when calibrating the monitor to user-preferred settings. For users that require a wide variety of calibration functionality, EIZO bundles its proprietary ColorNavigator 6 software. Preset target values for photography, printing, and web design are included for users looking for a simple way to calibrate the monitor. Experienced users can set their own target values for brightness, gamma, and white point, and generate an ICC profile. ColorNavigator 6 offers several advanced functions such as measuring the white of the paper to be used for printing for better screen-to-print matching and profile validation for verifying calibration results. Because ColorNavigator 6 is proprietary software, EIZO has ensured it is compatible with a wide range of calibration devices from X-Rite, Datacolor, and other manufacturers2 and supports Macintosh, Windows, and Linux (Red Hat 6.4) operating systems. Updates to ColorNavigator 6 are available on www.eizoglobal.com free of charge. An ergonomic stand with 35° tilt, 344° swivel, portrait mode, and 148 mm height adjustment lets users place the screen in the optimal position. The stand has a sturdy build and includes a cable holder for a clutter-free desktop. 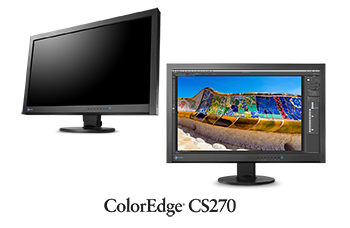 The ColorEdge CS270 is backed by a five-year manufacturer’s warranty including the LCD panel3. This is at least two years more than the warranty of most monitors to ensure long service life and low total cost of ownership. Gamma curve for each monitor adjusted on the EIZO factory line. Two upstream and two downstream USB ports. Supports EIZO’s UniColor Pro software that simulates color blindness so designers can choose color schemes for maps, road signs, web sites, etc. that can be viewed by everyone. EIZO shading hood for reducing ambient light reflection available as an option. 3 The usage time is limited to 30,000 hours.